At Tom’s Superfruits Superstore there was this black rice pudding which I am now obsessing over. Tip: Warm the rice pudding up and do some rain-watching. 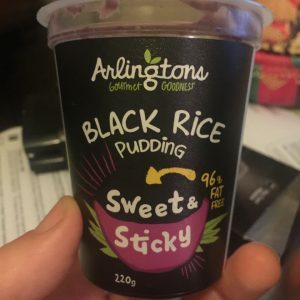 From Arlingtons: Arlingtons Tapioca and Black Rice puddings are simply delicious. A fresh modern twist on old fashioned puddings, just like Grandma Lil used to make. Made fresh with real fruit and coconut, the puddings are gluten free, dairy free, vegan friendly, and made from real ingredients. The fruit flavours are 97% fat free too! Served in a lunchbox friendly tub, they can be served cold as a refreshing treat, or gently warmed as a winter indulgence. Check out this website to see their other Vegan goodies!